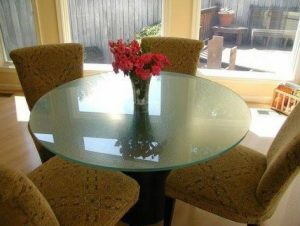 We have all seen tables that have sleek looking glass top covers. They look very modern and cool, but do they serve any other practical purpose? The answer is yes. In fact, glass table top covers serve many practical purposes that will save you time, money and allow you to get the most out of your table. A glass cover will preserve the useful life of your table. By serving as a top buffer above the table’s surface, a glass cover protects the expensive and sometimes sensitive wood of a table from scratches, water or coffee rings and even the damaging rays of the sun. That’s right, just as your skin can get sunburned from a day at the beach, the wood on your table can be damaged by midday rays. Over time, this can lead to fading or warping of the table surface, even with the highest quality wooden tables. Just as you would later up with sunscreen, make sure your table has a glass cover to protect it. These glass coverings also save you a whole lot of time. A table cloth has to be washed, and a hardwood table has to be cleaned in a delicate manner to as to not damage the wood. A glass top is simple by contrast. All you have to do is spray it and wipe it down. It takes almost no time at all to clean up after a dinner party with friends, giving you more time to sit and catch up with your guests. Affordable Glass & Mirror has many different types of stylish-looking glass table tops for very reasonable prices. Our glass tops can be customized with a wide range of different types of edges, from wave edges to ogee edges, each of which can add a new look to your table. We have many styles to fit your needs and can even provide you with a glass table top cover replacement if yours is ever damaged. If you are looking for a sleek way to prolong the life of your wooden tables, call Affordable Glass & Mirror today at 404-361-5151.